In Latin we have the noun "puer" and others related to it in Latin or Spanish, puella (girl), Pueritia (childhood), puerilis (childish), puerilitas (childishness), puerperium. Believe it or not, the root of “puer” is related to that of 'παῖς, παιδός', pais, paidós. We will analyze in some detail the term "encyclopedia". It is a word with a really curious etymology, from the Greek ἐν κύκλος παιδεία, (ἐν in, in, κύκλος, kyklos, circle and παιδεία, paideia, instruction) "statement in circle" or "circle of all the arts and doctrines (knowledge)". Perhaps it refers to the practice of placing children in a circle to receive the instruction or education. This meaning derives its present meaning first set of all sciences or many science or much knowledge. From the Greek phrase is created in Medieval Latin the term encyclopaedia, which means 'general education course'. And, besides this, my road is not a beaten track, nor one which the mind is much disposed to travel over. There is no one among us who has ever attempted it, nor is there any one individual among the Greeks who has treated of all the topics. Most of us seek for nothing but amusement in our studies, while others are fond of subjects that are of excessive subtilty, and completely involved in obscurity. My object is to treat of all those things which the Greeks include in the Encyclopædia, which, however, are either not generally known or are rendered dubious from our ingenious conceits. And there are other matters which many writers have given so much in detail that we quite loathe them. (John Bostock, M.D., F.R.S., H.T. Riley, Esq., B.A., Ed.). Praeterea iter est non trita auctoribus via nec qua peregrinari animus expetat. nemo apud nos qui idem temptaverit, nemo apud Graecos, qui unus omnia ea tractaverit. magna pars studiorum amoenitates quaerimus; quae vero tractata ab aliis dicuntur inmensae subtilitatis, obscuris rerum tenebris premuntur. ante omnia attingenda quae Graeci τῆς ἐγκυκλίου παιδείας vocant, et tamen ignota aut incerta ingeniis facta; alia vero ita multis prodita, ut in fastidium sint adducta. "The most learned man in every way was Varro, who read so many books that it admires us, that he had time to write, and wrote such abundance that we can hardly believe that anyone could read them." nemo enim omnia potest scire, (No one can know everything). We can also consider the Naturalis Historia of Pliny the Elder an encyclopedia: it is a veritable compendium of all knowledge then considered scientific or interest for understanding the world in which we live. We can also consider an encyclopedia the Twenty Books of Etymologies (Etymologiarum Libri Viginti), of Isidore from Seville (circa 556-636). But the "encyclopedia" for excellence has been so far the French Encyclopedia of Diderot and D'Alembert,” L'Encyclopédie ou Dictionnaire raisonné des sciences, des arts et des métiers”, published between 1751 and 1766 and 1777 supplements, synthesis of knowledge of the time and a symbol of the Illustration. Today, in the digital age, the "encyclopedia" par antonomasia”, pa excellence (from Lat. antonomasia and this of gr. Ἀντονομασία, name differently; adverb meaning the rightful name for being the most characteristic specimen) is Wikipedia; the word is constructed from Hawaiian wikiwiki, which properly means fast, casual, and classic -pedia, sufficiently discussed above. Wikipedia refers to a website developed collectively with universal encyclopedic pretensions: the contents of this page, multilingual free online encyclopedia, are accessible to any "internauta, (from internet or internal network and Latin nauta, navigator). All internauta also have access not only to the page but the ability to modify its contents. Its creator and who gave him the name is Larry Sanger. It now contains more than 37 million articles in over 284 languages. This is certainly a great creation of modern society, but we must have extreme care to accept the information provided in this way because it often lacks the necessary controls and contrasting elements that validate the knowledge and data provided. 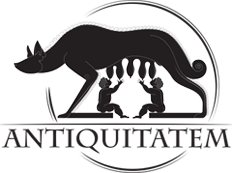 One of the rules of this blog or webpage http://antiquitatem.com/ is precisely generally offer fonts and text in Latin or Greek sources. To some readers may seem a heavy and slowing bit, but note that not only is an offering for readers who can read the classic languages, but also a guarantee for the rest of existing and real sources. Too often, many texts are not contrasted with the original sources and therefore large errors may occur.